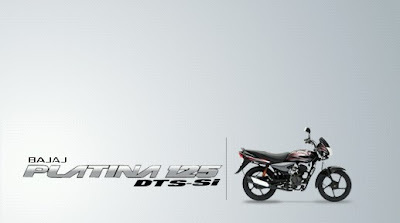 Going by the market forces, Bajaj launched yet another 125 cc machine, but at the same time gave it's existing 100cc Platina it's 125cc variant-- the Bajaj Platina 125 DTS-SI. I've ridden Piyush's 100cc Platina a couple of times and was very impressed by it's smoothness and output. All in all I found the 100cc Platina a good commuter city bike. But truely speaking launching a variant of the Platina instead of launching the XCD Sprint DTSI did surprise me a lot!! The 125 Platina shares the same engine as of the current XCD DTS-SI, so there's nothing new and exciting as far as the engine goes. But then again, the smart player Bajaj is, it has implement some small functionalities which might prove beneficial for it's future (if any) releases. Though this feature already exited in the existing 100cc Platina, but by implementing this feature in the 125cc variant Bajaj ensured that the bike offers desirable mileage to a concerned commuter. 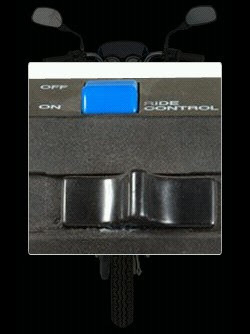 Basically what it does is, when the Ride Control Switch is on, the throttle twist is shortened. Meaning you cannot twist the accelerator to it's fullest restricting your speed burst, specially while cruising and thus giving a mileage count. But when ever you want to move ahead in the traffic and blast off (in commuter sense), just switch off the Ride Control and twist your wrist as far as the bike allows you. 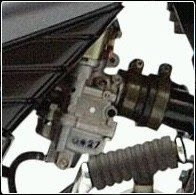 Depending on the Engine requirement/temperature, the Auto Choke does the job of increasing the idling rpm while bike is in neutral, without the requirement of any choke knob or switch. This is something new in any Carburated Bajaj Bike so far. Bajaj specifically claims a smooth bike starting specially during winters, which again needs to seen, but going by the kick-less Pulsar 200 and 220 experience, this move from Bajaj can prove to be a revolutionary one. Apart from these, in order to focus more on Efficiency, Bajaj has also implemented concepts like Lean Burn Principle Carburetor (which permits a leaner air/fuel mixture when the throttle is close to fully open), lowering overall weight of the bike and reducing the internal friction of the engine by implementing piston rings and piston skirts, roller rocker arms etc. The November issue of BS Motoring rates Bajaj Platina 125 (producing 9.5 ps @ 7K rpm) a tad higher than the current Bajaj XCD 125 and other conventional 125cc bikes, but finds it less exciting than the likes of Honda CBF Stunner (producing 11 bhp @ 8K rpm) and certainly not the Yamaha Gladiator Type SS/RS (producing 11 bhp @ 7.5K rpm). But again here we should keep in mind that it's a commuter specific bike and a top wack of 95 kmph is pretty much enough in city conditions (but certainly not for highways). By Piyush's 100cc Platina's experience I can certainly say that this is going to be a good commuter friendly 125cc machine. My take - if you want a good dependable 125cc bike with good technology go for the new Bajaj Platina 125, but if you want exciting 125cc ride, still Yamaha Gladiator 125 Type SS/RR rules the roost. Loads of Thanx for giving me place in your post. You're always welcome bro and the honor is always mine to mention and name my buddies in my blog!! Its really a rocking bike. It gives me a surprising 80KMPL mileage.